Early departure to the small seaport town of Paraty, that during the 18th century played an important role when gold from the mines in Minas Gerais was shipped out from here to homeland Portugal. Today it counts according to UNESCO to one of the most harmonic existing examples of colonial architecture world-wide! 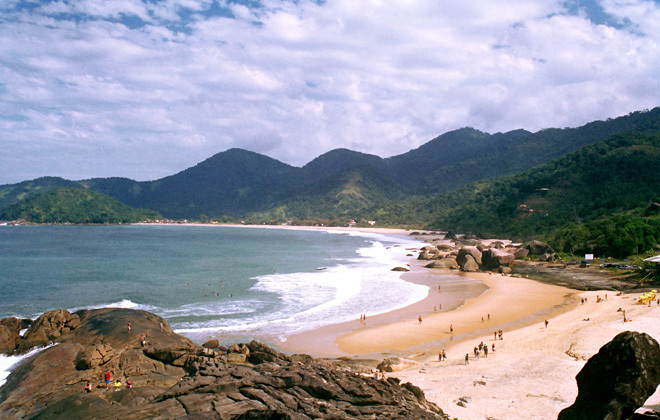 Here you experience an exotic mixture of culture, nature, beach pleasure and activity holidays. The about 4 hours scenic drive along the coast features great views on islands and little hidden beaches of overwhelming natural beauty. A charming pousada, located in the historic center of the town, awaits you for check-in and a refreshing jump into the swimming pool. From here it will take a short drive through the Atlantic coastal mountains to get to the former pirates village Trindade where you have time for swimming or walking on one of the dream beaches. Heading back to Paraty in the afternoon not before paying a visit to one of the notorious sugar cane mills that produce fine cachaça, the Brazilian national drink! The evening starts with a walk through the narrow cobble stone alleys still made by slaves and romantically lit by colonial candelabras. It follows a cozy dinner in one of the numerous good restaurants and a stroll through Paraty's boutiques of beautiful handicraft and Brazilian styled leisure clothing. 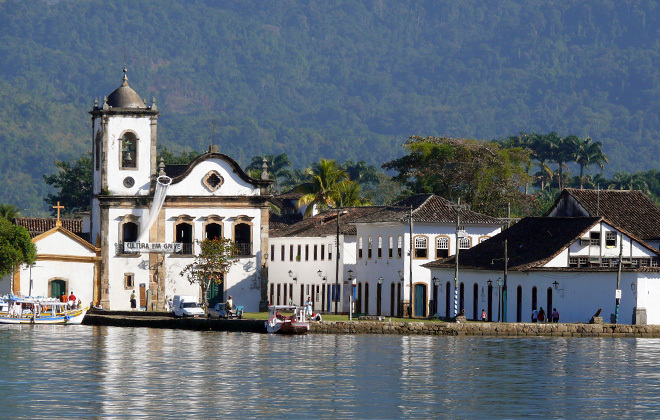 After breakfast you visit the small land marked baroque historical center of Paraty: its architectural gems from Brazil's colonial epoch, its patrician buildings and churches from outgoing 17th and beginning 18th century. As an itinerary of contents should offer contrasts, you board now a schooner for a four-hour boat ride through a tropical paradise full of tucked away islands and unspoiled beaches. At various stops you may enjoy a swim in the crystal clear waters. Return to Paraty late afternoon. The rest of the day is free. 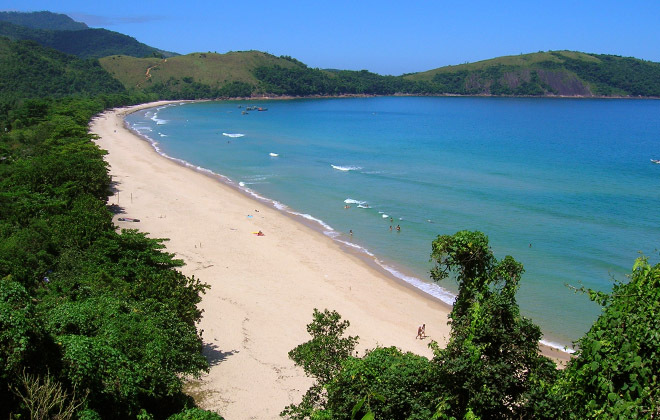 Today you will know two marvelous tropical beaches. Therefore you go first by regular bus to Laranjeiras, then you hike some 1½-2 hr through the lush Atlantic coastal rainforest. 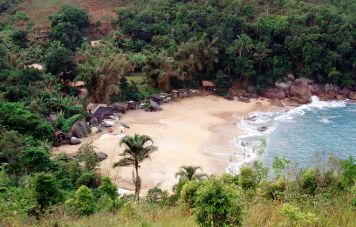 The destination is the fine sandy beach Praia do Sono, a paradise nearly untouched by civilization, inviting you to intensive enjoying of nature, swimming in the sea and at the nearby waterfall. After lunch in the little restaurant of a fisherman's family, who lives right behind the 1.3 km long beach, you will visit, within walking distance the virgin beach Antigos. 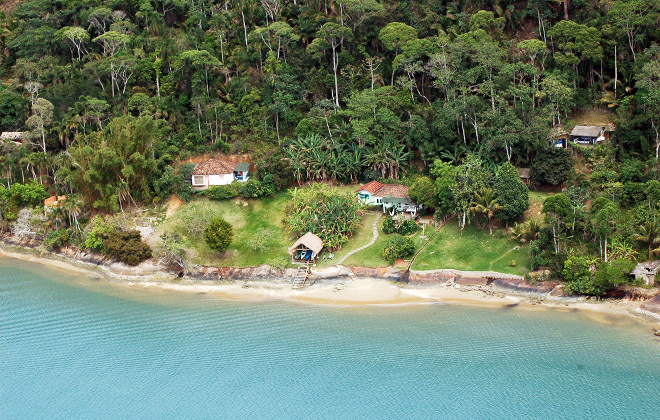 Return to Praia do Sono for dinner and overnight in a simple chalet. This morning you will take our boat heading for the isolated beautiful Ponta Negra beach, which is like its neighbor a nature reserve. You will have lunch in a typical restaurant at the small fishermen community who lives here. The beach pleasures aside, you will have the opportunity to familiarize with the locals, a community of the so called Caiçaras, a people who descend from Indians who habited the coastal regions of the Southeastern and live mainly from fishing activities and small plantations. In the late afternoon return to the beach Praia do Sono. Dinner and overnight. After breakfast return to Laranjeiras by boat and from there 2 hours of smooth hiking to the Saco de Mamanguá, Brazil's only fjord. A delicious lunch awaits you in the house of a caiçaras family, surrounded by mangrove forest. The family conducts a small handicraft workshop and you will learn how the multicolored boats, sold in Paraty as arts and crafts, are carved from the soft caixeta wood Tabebuia cassinoides. Now, again you board our boat, and with your luggage, you will arrive at the Refúgio Mamanguá. Beach lodges, with wooden terraces providing a marvelous view of the calm bay, will be your home for the next 2 days. The houses belong to a project, which, for years, deals successfully with the conservation of the region and the consciousness-shaping of its traditional inhabitants, the caiçaras. Seafood dinner and overnight. The day is set for activity as you will hike to the top of one of the highest mountains of the region, the Pico de Mamanguá. Therefore you first cross the bay (saco) by kayak in an about half an hour trip. 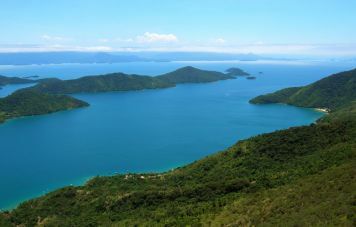 The trail, with an appropriate break on the peak to enjoy the majestic view of the green mountains and white beaches and the calm sea, takes about 3 hours. The lunch today consists of catch fresh giant shrimps, bought by fishermen and grilled in a bar at the beach. Time for a swim and relax. Afterwards return trip by kayak to the Refúgio. Dinner and overnight. 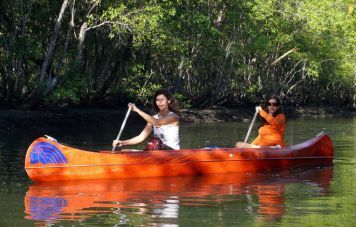 Fortified by a hearty breakfast, you will paddle to the end of the bay, inspect an oyster culture and enter with the kayaks into the bizarre mangrove landscape. The roots of the mangrove trees and shrubs and the accumulated sediment between them are an important breeding and maturing area for fish, crabs and shrimps, which you will meet everywhere on the way. At a hidden, enchanted place you finally will find a waterfall where you can take a refreshing shower. On the way back lunch in a fishermen restaurant. 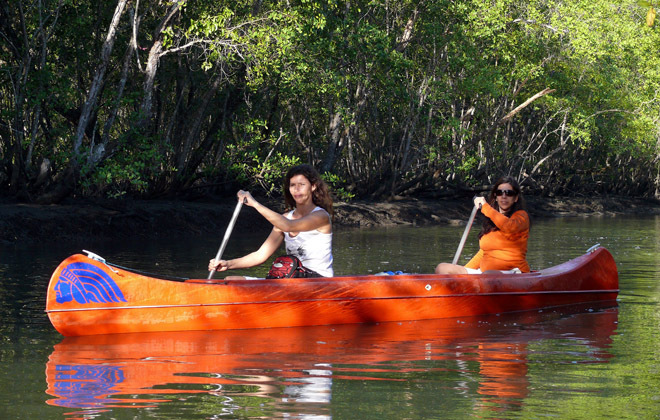 You return by kayak to your accommodations at refúgio. 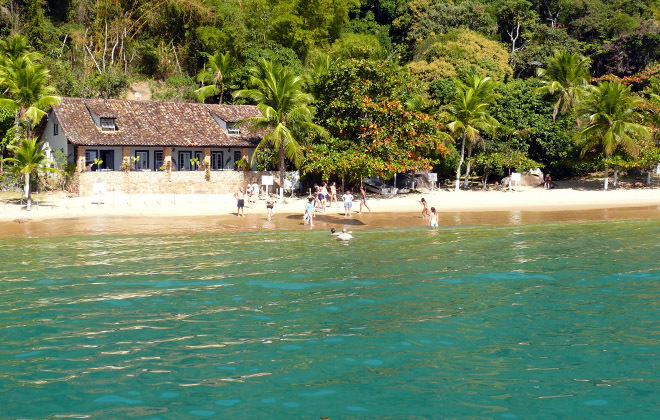 A whaleboat will take you to Paraty-Mirim, from where you take the regular bus to Paraty back to your pousada in the historical center. The evening is free. This morning we will pay a visit to the nearby village Araponga of the Guaraní Indian tribe, natives from the border region of Paraguay and Brazil (from the film “The Mission”), who have settled down around Paraty. In co-operation with the NGO Nhendeva we support a social project. After a jeep ride and a hike through the Atlantic rain forest, which takes about 2 hours, you reach the settlement in the mountains. 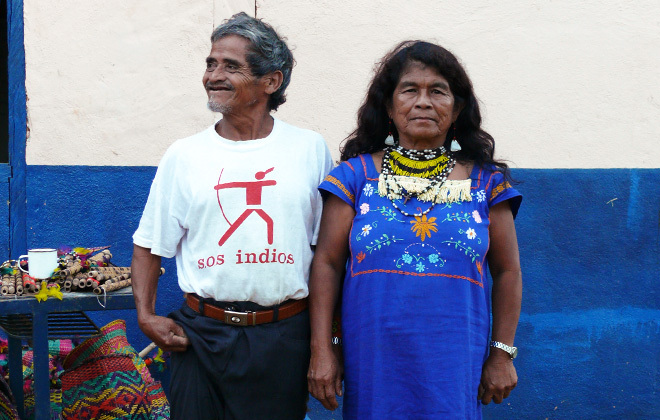 Contacts and discussions with the chief, the kazike, and the habitants of the village take place here in a way that you will learn many interesting things about the daily life, customs, culture and naturally also the problems of the Indians in the modern Brazilian society. From the village a jungle path leads you to a very beautiful waterfall, where you can take a refreshing bath. Meanwhile the lunch is prepared for us by the Indians. The visit certainly is an important experience and one of the highlights of the stay in the region. In the afternoon return to Paraty and transfer to Rio de Janeiro, flight back to your country or extension of the itinerary.